Tomorrow is the day. I’d be lying if I said I wasn’t scared. No matter how many times I’ve gone in for surgery – it never gets easier. The nurses in pre-op did the whole height and weight thing, drew blood and gave me the whole run down for the morning of surgery. The bad news is that I have to take the glitter nail polish off my nals, rude. And then, my favorite part, I met with the anesthesiologist. Signing the paperwork pretty much signified signing my life away to them. We also had a very serious descussion on the importance of my immediate medication/sedation when I arrive on Monday morning at 530AM. Versaid and Ativan are absolutely necessary the morning of surgery. And since I am NPO (nothing by mouth) after midnight, I will desperately be in need of pain medicine. When I got upstairs to clinic, I was reunited with some of the staff at the Paley Institute that I haven’t seen in years. They are like family. I am unbelievably supported here and I know that I am in the right place. In the exam room, the images from the most recent MRI were up on the screen. Unreal. Visible proof as to why I am in excruciating pain all the time. 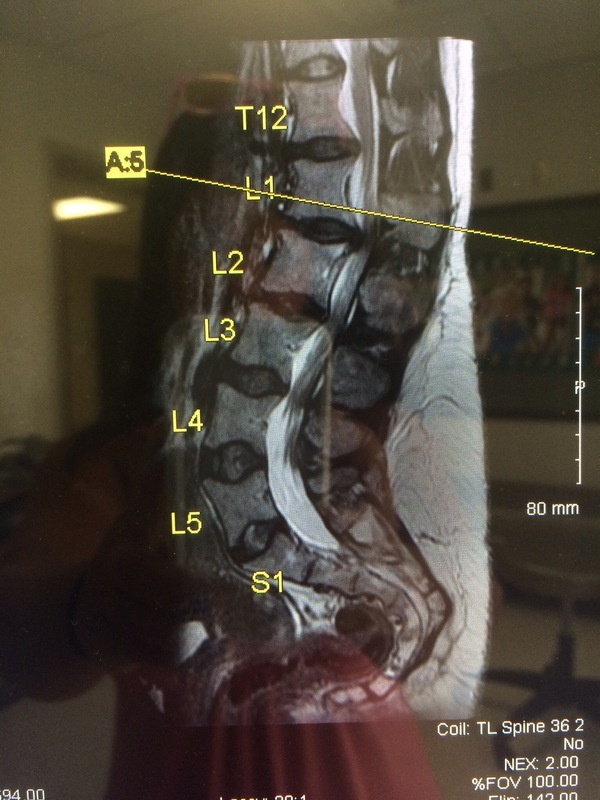 See for yourself, L1 and L2 – my spinal cord and the nerves that innervate my legs are being crushed. Thats what the darkness shows – it should be white. Dr. Feldman’s physician assistant, Tiffany, came in and answered all of my questions. The faucets in my eyes would not turn off, I wasn’t embarrassed; that was how I was feeling. She continued to talk to me as I just sat on the table with tears falling into my lap. I am not invincible. Spinal stenosis is very common in individuals with dwarfism. I am one of the lucky ones. Dr. Feldman came in and stretched his hand out for a handshake. That wasn’t going to work for me and he learned right then that I am a hugger. He took the list of questions that I had in my hand and started going down the list. Number two read: “a glass of wine the night before surgery?” He looked at me and very seriously yet with a smile, responded, “6 oz. not one of those wine glasses that hold an entire bottle.” Check. After all of my questions were answered, hugs were given and a small puddle was left on the floor from my watering eyes, I was given a perscription for a back brace that I needed to go get measurements for. Yay. My very own, personal prison to look forward to. Before embracing that unruly situation, I treated myself to a delightful Thai lunch in downtown West Palm. Since I can barely stand, having the measurements taken for the brace took longer than expected. After all was said and done, I was exhausted. The rest of the evening was an intimate date with my bed, leftover Thai food and The Food Network. Yesterday (Saturday) was a tough one to start. With little sleep under my belt, I found it very difficult to get out of bed. And then there was an offer I couldn’t resist: Bloody Mary’s poolside with Uncle Frankles. When I say that my support system here in Florida is a strong one, I mean it. My Uncles Frank and Jon also live here. Family all around. The mention of sunshine and libations poolside did the trick and I took a little drive to Boynton Beach. It was worth it. Since my first surgery here in Florida in 2009, I have also come to know some sweet sister friends here. Jada and Rachel both took care of me when I was in the hospital and we have been friends ever since. We manage to pick up right were we left off, every time we see eachother… once every 2-3 years. Last night Jada scooped me and we went to Mortons in downtown West Palm Beach for dinner and drinks. 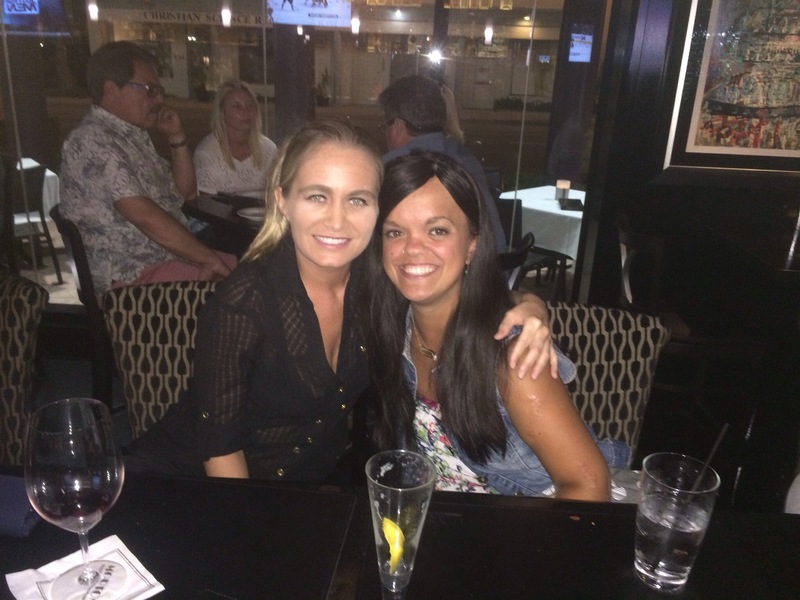 Our night ended with a sweet older woman who was insistent that I was one of the ladies from Little Women LA. No, ma’am. Not even close. But I have learned to find the humor in situations like that.. We actually chatted for awhile and it turned out that one of the women was from Charleston. Small world! Thank you all again for the encouragement and love. That MRI looked like my Dad’s. You definitely need surgery sweetie! Good luck with everything and wear that back brace. It won’t be as long as your external fixators.